Alice Finch's 400,000-brick LEGO Hogwarts would be impressive enough if she had built just the outside of the grand magical school. But inside, her Hogwarts is even more glorious, containing the rooms and passages Harry Potter traveled in his school days, from the Hogwarts kitchen to the Room of Requirement, creating the perfect sets for minifig Harry, Hermione, and the rest of the Hogwarts crew to reenact scenes from the books. The Brothers Brick has an interview with Finch about her massive Hogwarts, which won both the Best in Show and People's Choice awards at BrickCon 2012. Finch spent 12 months assembling the campus, combining elements from the books and movies to create a complete structure inside and out. 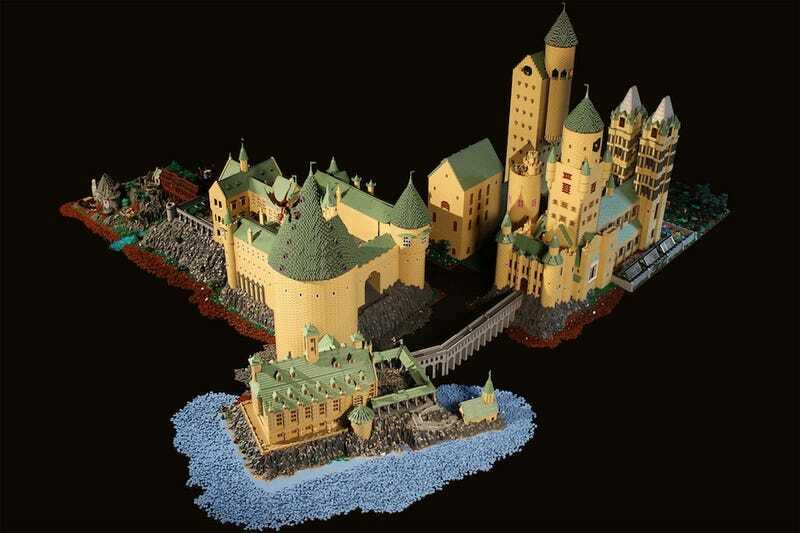 For her two sons, this Hogwarts is the ultimate playset; her older son, who has read the books, enjoys posing the tiny students and staff about the school. When her younger son is old enough to read the books, he will find he has yet another way to experience the magic of Hogwarts. These are just a few of the multitudinous rooms and structures Finch constructed. I highly recommend heading over to her amazing 75-photo Flickr set to see all of the scenes she put together and all of the ghosts lurking in her own magical plastic world.